Given the fact that Americans experience snowstorms that can sometimes make snows to pile up as high as 7 feet on the streets and atop residential houses, and sometimes burying parked cars, many Americans find it difficult to believe that global warming and climate change is actually fast approaching…indeed here with us. 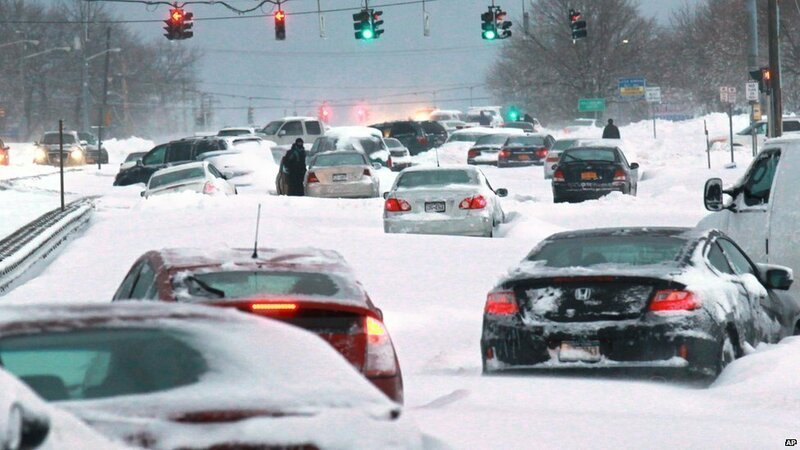 People in upstate New York experienced enduring snow blizzard early November, and this natural phenomenon among others make people to doubt the claims that climate change could be real in any manner – however, given the fact that sudden spring-like temperatures made the 7 feet snow to turn slush is indicative of the climbing threat of global change. As in other climes, Americans are hesitant to believe that the earth is edging toward climate change occasioned by greenhouse emissions and industrial gases that threaten the ozone layers. According to Aaron McCright of the Michigan State University, “there’s really little to no evidence of that (in the US); he said people do not believe that climate change is underway and caused by man, and that it constitutes an immediate threat to everyone whether individual perceptions agree to this or not. Outlined in the Intergovernmental Panel on Climate Change’s fourth report of 2007, the scientific consensus on climate underlines the fact that the warming of the climate system is unequivocal, as is now evident from observations of increases in global average air and ocean temperatures, widespread melting of snow and ice and rising global average sea level. “Global warming” is the cause, “climate change” is the effect. They are two sides of the same coin. They always have been. Just because it is cold all over the USA does not mean that it is cold all over the planet. 2014 is on course for being close to or surpassing the hottest year recorded, and that is without an El Nino event in the pacific to drive the global heat up. i.e. The “no warming for the last 16 years” mantra is another crock. “Just because it is cold all over the USA does not mean that it is cold all over the planet”…that is because some countries are in summer you goose *LOL*….if it is too hot it is global warming, if its too cold it is global warming……seriously, what a load of garbage, no wonder more and more people are now seeing the scam that man made global warming really is. I could add more words to the explanation I gave, but I am not sure that you would understand. The *global* average temperature is largely in balance (but still slowly rising overall). It does not fluctuate with the seasons BECAUSE when it is winter in the north it is summer in the south. It is too cold *locally* in the USA. The US temp is not the global temp. The reason for the sudden cold snap is because the Jet Stream has altered course, dragging Artic air down into the USA. If this is all too hard for you to follow, I can make it easy to understand: on one side you have scientists in almost universal agreement. Including tens of thousands of scientists that have never and will never receive a penny off the back of climate science research. On the other side is a bunch of f*u*c*k*w*i*t*s that think they can change reality by disagreeing with reality. Our planet can only take so much and then our ecosystem changes. This is underway and our children will see it’s negative effects very clearly. To avoid a worldwide depression our world economy needs to grow. The planet simply can not sustain this never ending economic growth. It is only in space that mankind will find the resources and space necessary for unlimited growth. If we do not establish a self sustaining human presence off of earth mankind will die a slow death in poverty. Burn the land and boil the sea. You can’t take the sky from me.